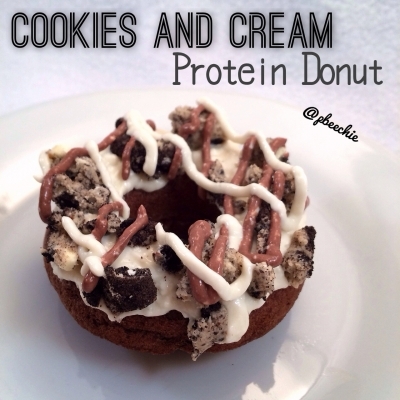 Chocolatey, creamy flavored protein donuts. The crunchy cookie bits on top is the best part if you ask me! Preheat the oven to 350 F. Grind the oats into a flour. Then add 1 tbsp almond meal/flour, 1/2 scoop chocolate whey protein, 3 egg whites, 1 tbsp unsweetened cocoa powder, 1/2 tsp baking powder, and 2 stevia packets. Blend again. Spray a donut mold pan with nonstick spray. Pour batter amongst 4 donut molds. Bake at 350 F for 10 minutes. For the topping, use a handblender to blend 2/3 cup lowfat cottage cheese, 1/2 scoop vanilla whey protein, and 1 stevia packet. Then split the batter in half and added 1 tsp unsweetened cocoa powder to one of the halves. Put on each donut. Then crumble 1/2 cookies and cream quest protein bar amongst the top of the donuts.